Laurent Giles designed Westerly 33 centre cockpit fin keel sloop. A tough cruising yacht offering six / seven berths. In current ownership for 15 years, wintered ashore for 6 months annually, mast down. Regularly upgraded. Built by Westerly Marine in 1979. Part 1 British Registration. Good home wanted so offers considered on the asking price. Cast iron external Fin Keel. Wheel steering with cable links to half skeg supported rudder. Emergency tiller. White GRP deck, forward / aft coachroof and self draining cockpit, Grey non-slip painted deck and coachroof surfaces. Varnished Sapele mahogany interior joinery. Teak & Holly sole boards. 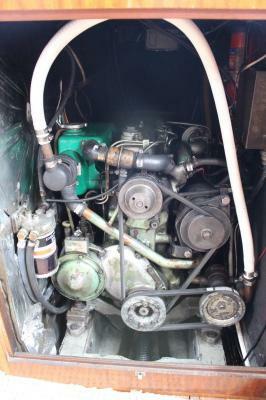 Mercedes 636 42HP four cylinder diesel engine, fresh water/heat exchanger cooled. 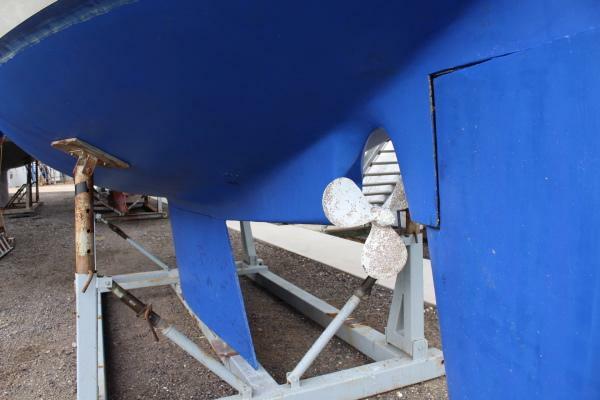 2014 reversing reduction gearbox and drive plate with shaft driven skeg supported 3 blade propeller. New water pump 2011. 6 knots cruising – max. 7 knots. Serviced annually. Various spares including shaft. Freshwater - 200 litres in s/steel tank. 25 litre hot water tank – heated by engine & immersion. 12 volt system: 2 x 12v batteries – new 2014 - charged by engine driven alternator. 12v lighting throughout. Navigation lights. 240 volt system: Shorepower lead and connection. RCB. Sterling 20ah marine battery charger. Immersion heater. Plastimo bulkhead compass and Bosun Grid compass. 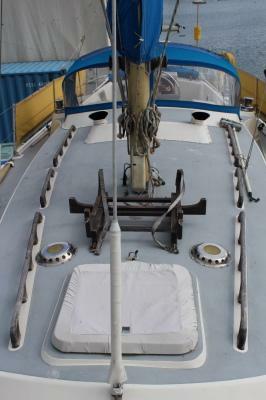 Proctor alloy mast, slab reefing boom and spinnaker pole. 1 x 19 stainless standing rigging – replaced 2008. Rotostay headsail furling gear – new 2008. Six / seven berths in three cabins with separate access to aft cabin. New foam mattresses. Separate sleeping mattresses for saloon – 2016. Hot & cold pressurised freshwater system. Eberspacher diesel fired cabin heating to aft cabin, saloon and forecabin. Stereo radio/CD player/SD card new 2017. 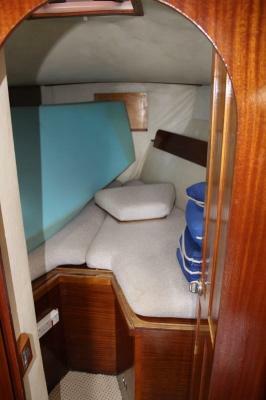 Forecabin - V berth foreward with infill to form double berth, hanging locker and storage shelves. Separate head to port with manual sea toilet, stainless steel wash basin, hot and cold water with shower. teak grating. Hanging locker opposite. Saloon with settee berths to port and starboard, lee boards (port berth converts to double) with drop leaf table midships. Large chart table aft to port with bookshelf and navigators seat. 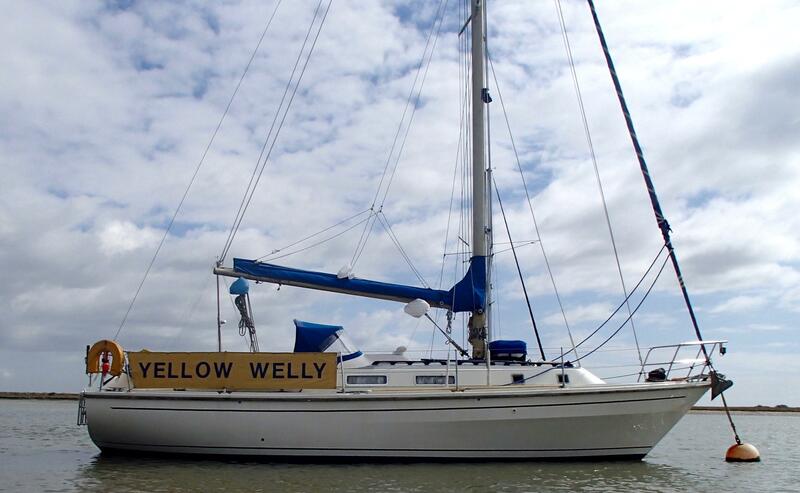 Galley to starboard with stainless steel sink, hot & cold water, large 12v fridge (under saloon seat), 3 burner gimballed gas cooker – new 2015 (gas system not guaranteed to comply with latest B.S.) with oven – electronic ignition. Good stowage. Aft cabin with two single berths accessed from cockpit. Deep centre cockpit with two cave lockers and steering pedestal. Folding blue sprayhood – new window 2015 & zips 2017. Mooring warps & fenders, deck brush and boat hook. Manual & electric bilge pumps. Fire extinguisher and fire blanket.